I love this as a metaphor for life, and for attachment. Many of us get attached to “things” (me included). I try to remind myself that we don’t *really* “own” anything in this world, we merely get to *use* things for a time. We come into the world without possessions, and we leave the same way. While we’re here, we get to use some material objects, but they aren’t a part of us in any real sense. Or at least they shouldn’t be. They’re just tools. I try to remember this when I experience the loss of something (some thing) I’ve deemed important. I try to remember that material objects have no inherent meaning, other than the meaning I’ve given them. And I try to examine my attachments, and whether they truly serve my peace of mind. We get to use things while we’re here. Let’s use them for our good, and the good of others. I came across this today, and it seems appropriate as tomorrow is the first day of classes at our university. My teaching friends should particularly enjoy it. All those inspirational metaphors about “falling down and getting back up” have never worked for me. I understand the sentiment, but I always think: everybody gets up. It’s what you do after you get up that counts. Some people will stand still. Some will move forward, slowly, dragging their feet and resisting the need to move on. Others will run recklessly toward the same situation that made them fall down in the first place. Some might sit down for a moment and reflect on what went wrong, some might ask a loved one to hold their hand for a while, and some might forge ahead without really processing what happened so they can take a lesson from it. Here’s a different metaphor that I like better. Imagine a long pole across your shoulders, with bags hanging on each end, and each of the bags has weight – these are “burdens.” Some might be related to work, or to family, friends, or finances. Some are heavier than others. Sometimes life hangs a new “bag” on your pole. This leaves you feeling unbalanced, as you were used to carrying your burdens a certain way, and now there’s a new one. You have to adjust, get used to the added weight and the way it’s distributed over you. Then you can start stepping forward again. Fortunately, weights can be removed, too. The resolution of a problem or a difficult situation makes the burden lighter – but we still have to get used to the change. 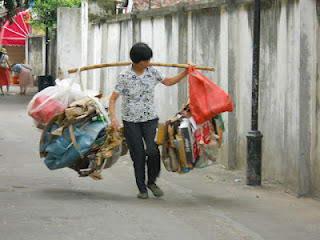 We can also take on the burdens of others, in an attempt to lessen their load. I’ve had a rough couple of weeks. I fell down, and I got back up … because that’s what you do. Now I have to adjust to this new weight, and start stepping forward. Still working on syllabi and lesson plans, attending meetings, and all the busyness of the start of the school year. This morning I served on a Q&A panel for new faculty, which was a lot of fun. We have some really clever and eager new colleagues joining us this year. Take a moment today to breathe, to just stare into space and think. This is life, right now, this moment. I’m here in the office, setting up the course websites for Fall 2018. School starts a week from Wednesday (August 29), and I have various meetings and appointments next week. Fall semester seemed so far off, and now it’s like a freight train barreling down the track at us! I’m also moving offices – just two doors down, but a bigger (corner) office with much nicer walls and carpet than my current one. The current occupant of that room is moving downstairs to an office that’s being vacated by a retiree – but his stuff is still in that room, so the process can’t begin just yet. The retiring colleague is the first “domino” in this process. I’m just hoping I won’t be trying to move during the first week of classes, but we’ll deal with it if we have to. I still haven’t finished the book manuscript, but that has to be moved to the “back burner” for now. Must finish course prep and get this move done. Going up north for the weekend to visit my parents. I’ve discovered that it’s futile to wait until a “good time,” I just have to make time and go. Otherwise there’s never a good time and I never stop working. Girl needs a break now and then. Universities can be hotbeds of stress – for students and faculty alike. This article encourages us to rethink our cultural attitudes toward mental health, and to be more proactive in providing support for those struggling with anxiety in an academic setting. Definitely worth a read, and a “think,” for all of us in higher education.